The Access and Integration Maternity Care Mapping (AIMM) Study explores the relationship between access, integration, and density of midwives in the United States and key birth outcomes. You are invited to explore the maps yourself here and see how your state ranks here. You can find the full report here, a lay summary here, and access the data here. The lead researchers have identified some of the key findings from the maps. Green outlines indicate states with lowest cesarean rates, while red outlines indicate highest rates. The darkest purple states received the highest MISS integration score. Green outlines indicate states with highest VBAC rates, while red outlines indicate lowest rates. 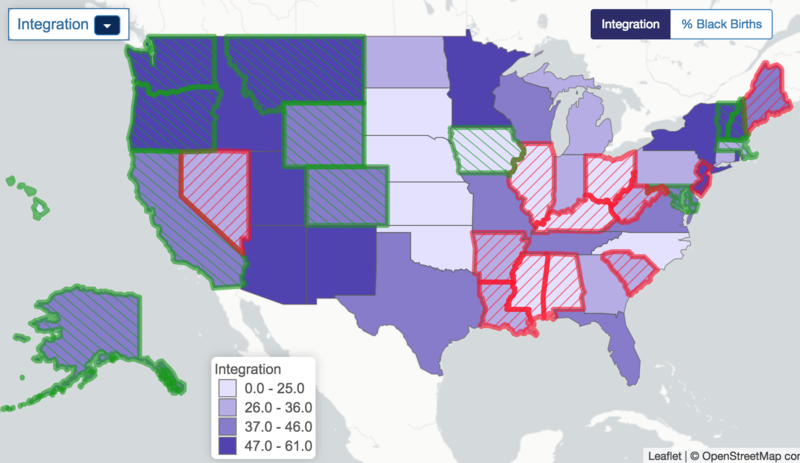 The darkest purple states received the highest MISS integration score. Green outlines indicate states with highest rates of spontaneous vaginal delivery, while red outlines indicate lowest rates. The darkest purple states received the highest MISS integration score. 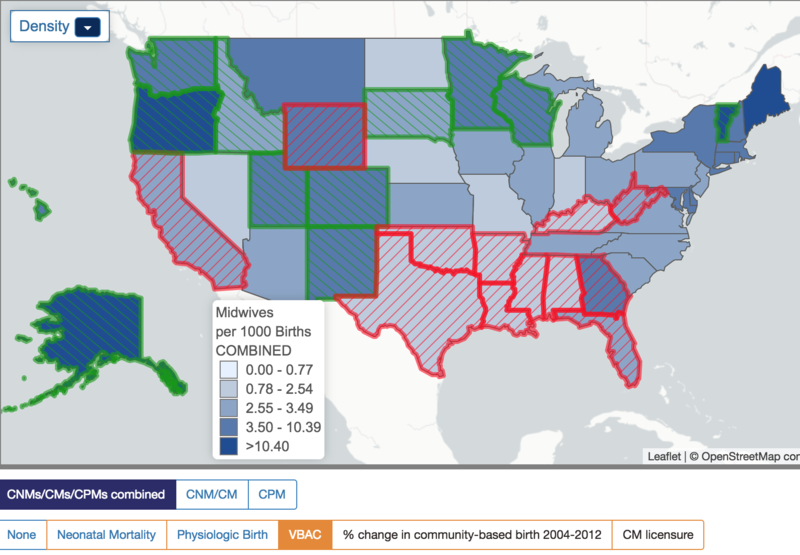 Green outlines indicate states with lower rates of preterm birth, while red outlines indicate higher rates. The darkest purple states received the highest MISS integration score. Green outlines indicate states with lower rates of low birth weight, while red outlines indicate higher rates. The darkest purple states received the highest MISS integration score. 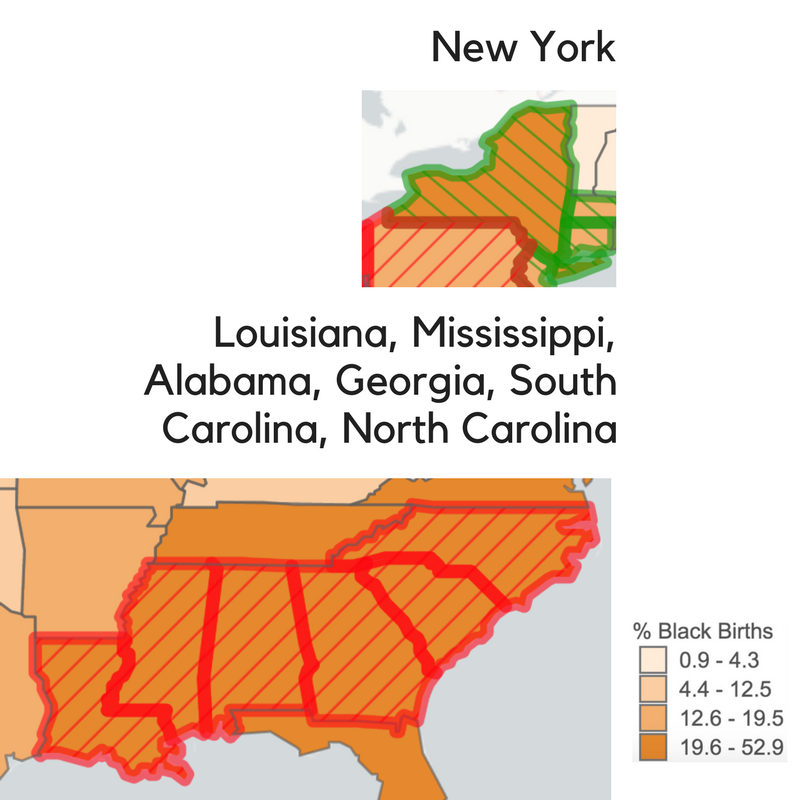 Green outlines indicate states with higher rates of breastfeeding at birth, while red outlines indicate lower rates. The darkest purple states received the highest MISS integration score. Green outlines indicate states with higher rates of breastfeeding at six months of age, while red outlines indicate lower rates. 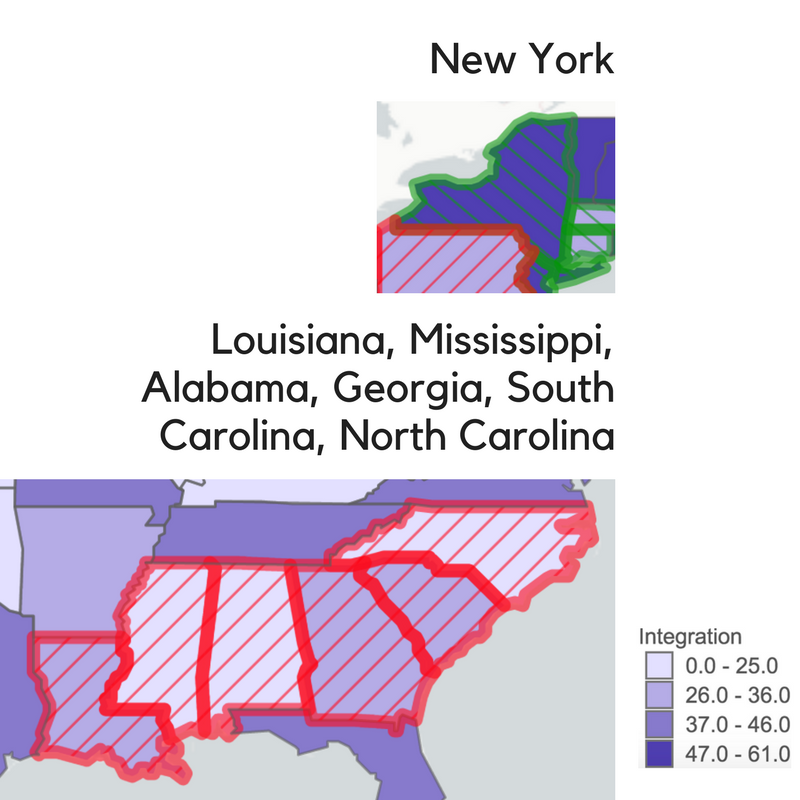 The darkest purple states received the highest MISS integration score. The image above shows the association between density of midwives and VBAC, please see the full maps to view how density of midwives is associated with other outcomes. Almost all the same states with high rates of Black births have the very lowest MISS scores and fewer midwives and fewer options for community birth. These states also have the highest rates of neonatal mortality. Improving access to and integration of midwives in these states could have powerful positive benefits for African American families. Red outlines indicate states with higher rates of neonatal mortality, while green outlines indicate lower rates. The darkest purple states received the highest MISS integration score. The darkest orange represent the highest percentage of black births. New York demonstrates how integration can impact outcomes in a state with a high percentage of Black families. This project was funded in part by a generous grant from the Transforming Birth Fund of the New Hampshire Charitable Foundation.